In the Volvo Ocean Race, Team Sanya successfully completed Stage 1 of Leg 2 at the secret port on Thursday evening, scoring a significant points haul over five weeks after racing began in Cape Town, South Africa. 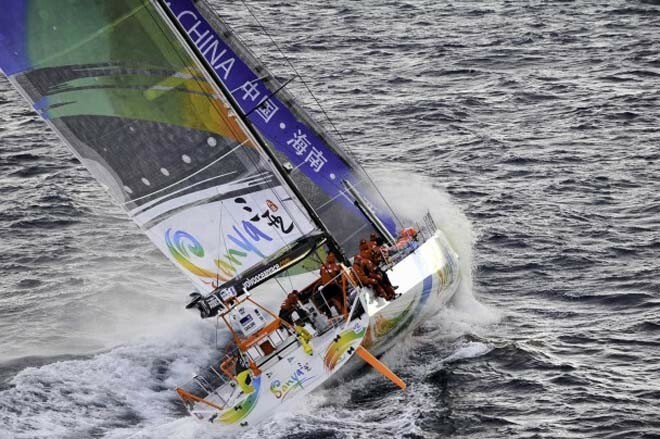 The crew of seven on board the first Chinese entry in the Volvo Ocean Race crossed the finish line at the undisclosed location in the Indian Ocean at 19:03:16 UTC, with an elapsed time of 39 days, six hours, three minutes and 15 seconds. Skipper Mike Sanderson and navigator Aksel Magdahl, who were not on board for the finish, leaped onto Sanya from a motoring tender to reunite and celebrate with their crewmates just moments after the finish whistle sounded in the pitch black dark. The finish signifies a successful comeback for the team, who crashed out of Leg 2 with damaged rigging while they were leading, suspending racing on December 20. The team sought refuge at Madagascar, where they remained for two weeks repairing their D2, before resuming racing on January 7. A tropical cyclone, the Doldrums and some short-lived trade wind sailing were all thrown into the mix as the crew endeavoured to finish what they started. Despite finishing last in the leg, Sanya will collect four points for the first stage of Leg 2. Under race rules they will also collect one point for the second stage and a further two points for the Etihad Airways In-Port Race in Abu Dhabi. There will be little recovery time for the sailors – Mason, Ryan Houston, Dave Swete, Bert Schandevyl, Cameron Dunn, ‘Tiger’ Teng Jiang He and Media Crew Member Andres Soriano – with the Leg 3 race to the team’s home port Sanya scheduled to start at 0800 UTC on January 22. Sanderson said work on the boat would resume at first light tomorrow, and was likely to continue until just hours before the restart. ‘We now face two hard days of work to prepare for the second stage of Leg 3. Of course we’d have wanted longer, but it is what it is and we’ll be ready,’ he said. On Saturday Sanya will be joined by the other five yachts, which are currently being transported on board a ship through high-risk piracy waters. The entire Sanya team will now regroup at the secret port and set their focus firmly on a triumphant homecoming to their home Hainan Province port in China in early February.